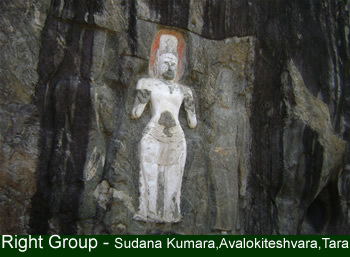 Buduruwagala rock carvings are very impressive. 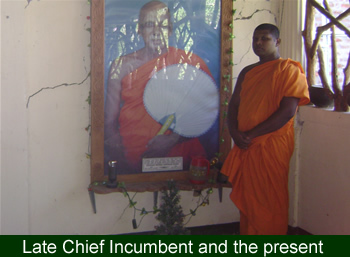 They are situated 3 KM away from Wallawaya - Hambantota road. 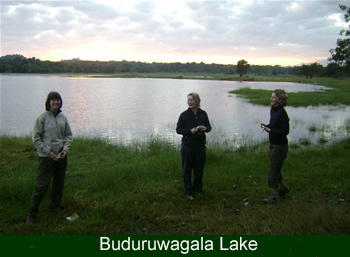 The entrance way is passing a dry zone village and jungle with a lake. The ancient site is situated bit away from the newly built Buddhist temple. The ancient site is with a massive rock gives you visual impression of a massive elephant keeling with a bowed head end of the folded trunk in its mouth. This image is manifested at the highest fold of the rock. This place is very special for Buddhist because it says about influence of Mahayana school of Buddhism in 8the Century A.D. 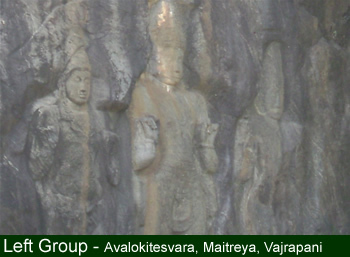 This has seven standing sculptures in relief at Buduruvegala are remarkable for their height and proportions. 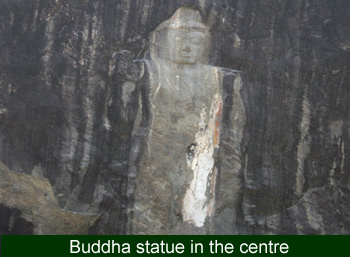 they consist of a Buddha in the center with attendant Buddhist on either side. To the proper right of the Buddha is Avalokitesvara who himself is attended by Sudhana Kumara and Tara on either side of him. On the left is Vajrapani with and attendant Bodisattva on either side of him. The bio diversity of the forest also very high. 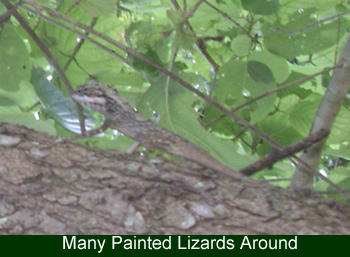 Bird and lizard watching and night jungle walks is interesting. The temple has a large crop cultivation behind. It is with good camping possibilities. The Buddhist monks are very helpful.